It was a brrrr-cold-windy-snowy Mother's Day Weekend - but for those up at the Lake, it was a fish-feast! Another stocking by DFW on Friday sure helped the cause. The top catching areas were up by the dam and in the channels as that cold windy weather stopped a lot of anglers from trekking to the back natural Lake. The Lake's gone down a bit from last week - probably due to the cooler temps, thus causing the run-off to shut down, but with the cooler temps and a bit of precipitation, we picked up another foot of snow at the Lake on Monday & Tuesday, probably a bit more up in the back country. Every little bit helps. NightCrawlers and PowerBait were the baits of choice up in the front although a few limits were picked up on lures. Those that did hike or drive to the back were using NightCrawlers. With the low level of the Lake, you still can't get a boat thru the channels to get to the back - but the fish sure can get thru! 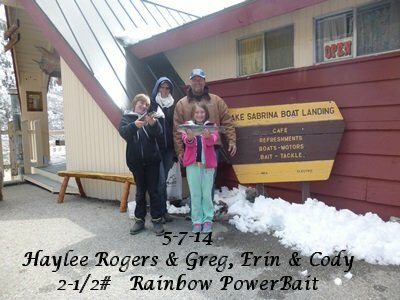 Haylee Rogers of Yucca Valley landed a nice 2-1/2 pound Rainbow on Rainbow PowerBait! We're still seeing the 2 Bald Eagle flying over the Lake and Rick's thinking we might also have a Golden Eagle hanging around. No sign of Yogi up at the Lake store, but there are bears in the canyon and we had a report of bear and mountain lion tracks on the trail to Long Lake on the South Lake side (also, Long Lake is still iced-over) - so keep your eyes open and your food and trash picked up. Speaking of trash - we are not your mothers - please pick-up after yourselves when you're out and about. If you're coming to the Lake, don't forget sunscreen and dark glasses - the glare off the snow (not sure how long it will last) is tough on the eyes. And if you have allergies - PACK YOU MEDS - it's tough breathing out there for some - what with runny noses, stuffed noses & watery eyes - believe me I know! The forecast is for temps to rise to the 70s for highs and mid 30s for lows. You can also check out www.weather.gov - enter Aspendell, CA (which is the little community right below Lake Sabrina) in the search field and you'll get the forecast for the higher elevation or take a look at Howard Sheckter, our local weather 'guesser' report at www.MammothWeather.com.